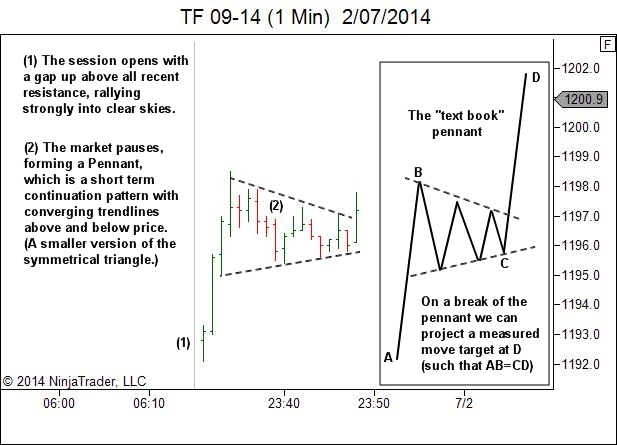 Tuesday offered a beautiful pennant in the emini Russell market. But here’s the problem with patterns, as I see them. Of course, that’s just my opinion. 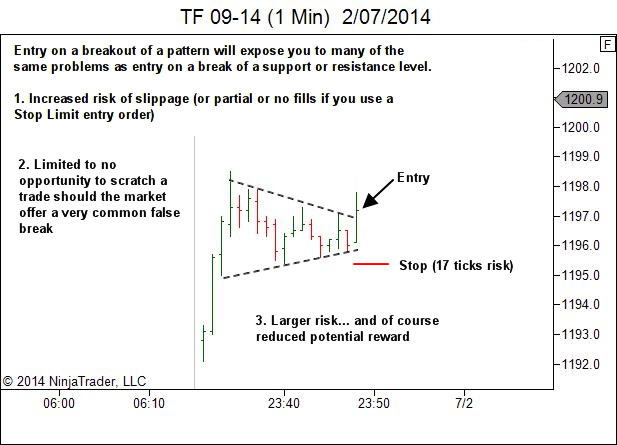 If you can get an edge through standard pattern breakouts, that’s great. Keep up your good work. It just doesn’t work for me that way. 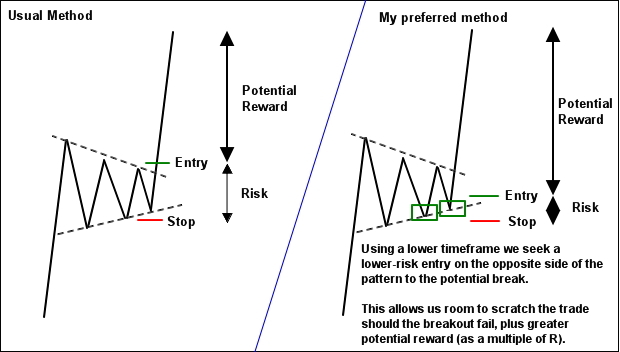 I much prefer to seek an entry on the opposite side of the pattern, offering lower risk and much greater reward should the pattern eventually break. 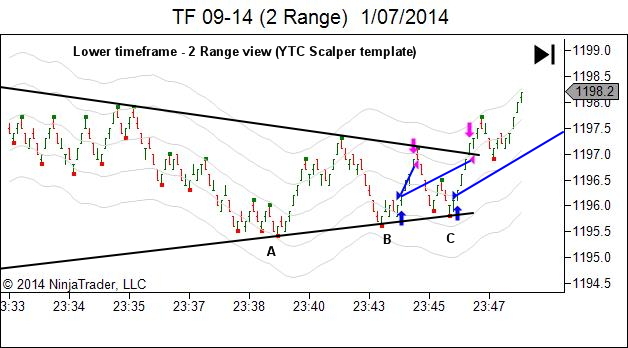 Readers of the YTC Price Action Trader will of course know that I’m not actually a “pattern trader”. The sequence from a YTC PAT perspective is an attempted PB long, followed by two CPB entries. See if you can spot them. 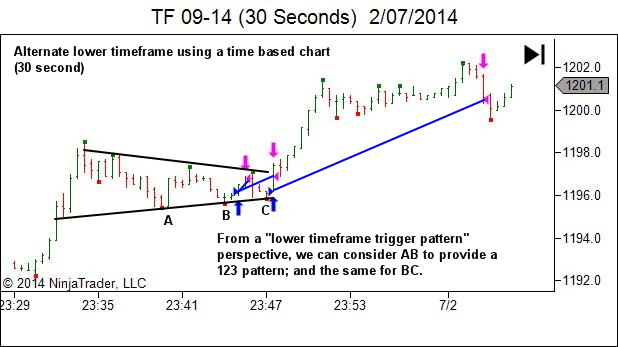 But the pattern was visually obvious as well, and was clearly on my mind as I sought my trade entries. It was a great confidence boost to know that my CPB entries were on the wholesale side of the pattern, should the pattern break and continue pushing the market higher. 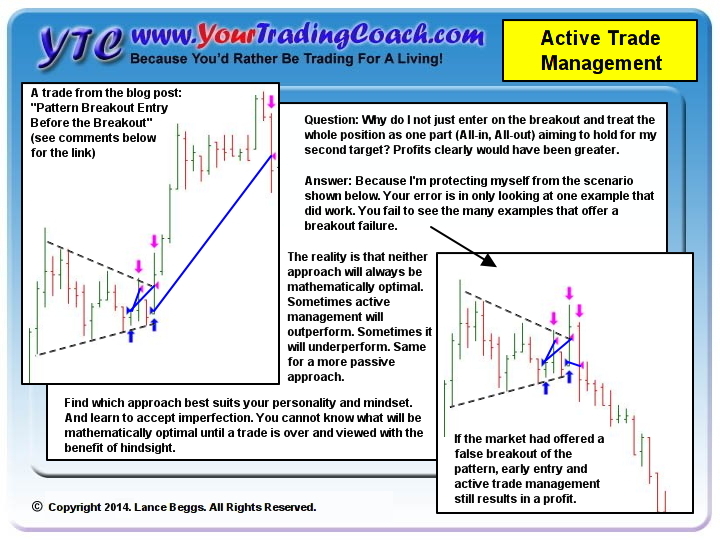 You will NEVER perfect your trade management approach. Instead of seeking that which is always mathematically optimal (and actually impossible to find), instead seek that which is optimised for your personality and mindset. And learn to accept imperfection. As always… this is simply my opinion. Do whatever you feel is right. you are really a smart man ! What software do you use to do your trades? Or what software can I use? We can use the similar technique for shorting on resistance, as you showed entry near support? Also should we wait for contraction of pennant before buying or selling? 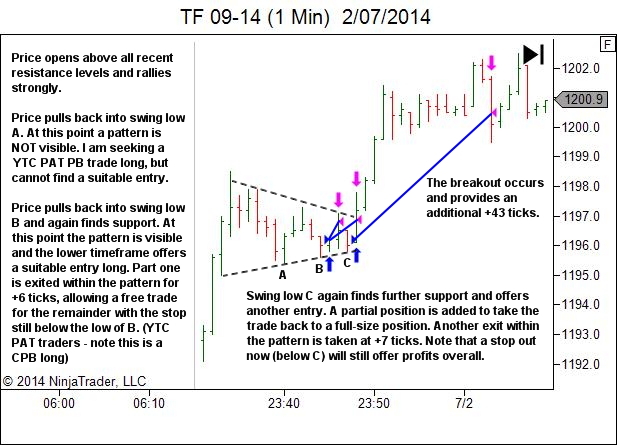 As usually breakout happens on contraction.